AMMAN - HE Dr. Talal Abu-Ghazaleh, president of the Arab Intellectual Property Mediation and Arbitration Society (AIPMAS) launched the Arab Center for Dispute Resolution (ACDR) accredited by the Internet Corporation for Assigned Names and Numbers (ICANN) as a dispute resolution service provider for the Uniform Domain Name Dispute Resolution Policy (UDRP) in the Arab region. The establishment of this Center represents a significant step towards more Internet protection and security for the entire Arab region and the world at large. It will maintain a variety of alternate dispute resolution mechanisms to allow affordable alternatives to litigation in order to resolve all types of disputes. 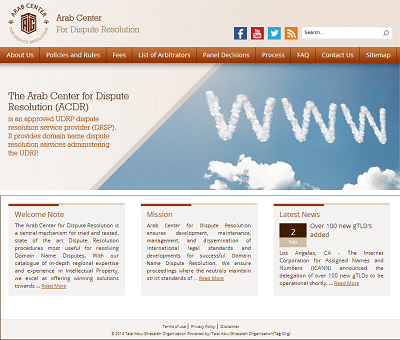 As the fifth globally accredited center in the world, the ACDR will have particular significance by focusing on domain name-related disputes which could be settled by proficient arbitrators in many languages. The ACDR is jointly established by AIPMAS and the Arab Society for Intellectual Property (ASIP), both under the chairmanship of HE Dr. Abu-Ghazaleh, with offices in all Arab countries. The ACDR has a diverse scope of activities including research, program development, outreach at all levels, as well as fostering an international staff knowledgeable and proficient in all aspects of Intellectual Property, with a particular specialty in domain name dispute resolution. To this end, the Center will utilize most novel approaches such as electronic interface, diverse knowledge of the legal system as well as deep knowledge of standing cultural and regional approaches to resolve legal disputes. On the other hand, the Center will develop solid partnerships at all levels in an endeavor to support Intellectual Property markets. It is worth noting also that TAG-Domains was officially recognized as an ICANN accredited registrar for generic Top-Level Domains (gTLDs) back in 2002.